The next generation of modern LED control is here! MADRIX 3 is about you, the user. We received many, many user request and we would all like to thank you all for your amazing feedback and creativity! Since you might have a lot of questions about the new features and changes, we created this page to keep you updated and to answer frequently asked questions. We think there are many reasons you might consider updating your license from MADRIX 2.X to MADRIX 3.X. And we will give you a first look here. But let's start from the beginning. - MADRIX 1.0 was introduced in May 2005. - MADRIX 2.0 came out in September 2007. - MADRIX 2.14c was released in March 2013. - All in all, over 40 updates were released since 2005. - Plans for MADRIX 3 were first revealed in spring 2012. - The final release date of MADRIX 3.0 is July 11, 2013. The change from MADRIX 1.0 to MADRIX 2.0 was enormous. It introduced a modern graphical design and provided the basis of the new MADRIX 2.X software range. The update was free for every MADRIX user. Nearly 5 years later, a lot has changed. More than 40 MADRIX updates were released to date and they were made available on our website, so that every user could download them free of charge. We have included hundreds of user wishes, new and improved features, fixture profiles, support for interfaces, bugfixes, and a lot more. Of course, newly purchased products were always shipped with the latest MADRIX version. The enthusiasm of everyone has helped us to create and improve a product, users simply love to use. General feedback and comments have been great. Thank you! "Our users said they want to control 3D matrices." This will be an amazing addition to the software. 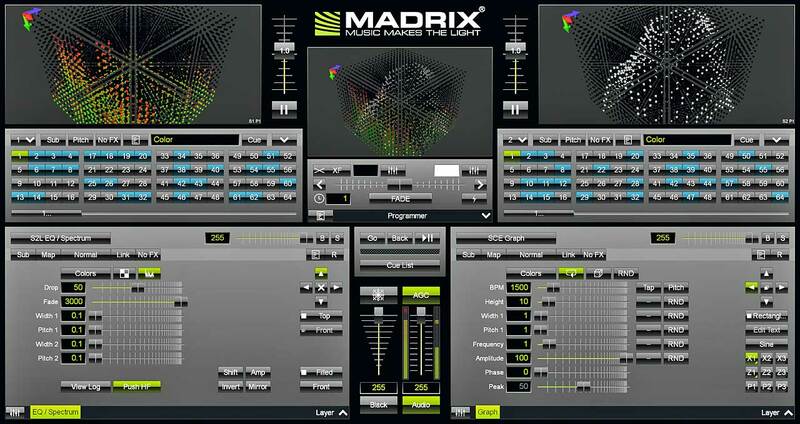 You will be able to use all the known possibilities of MADRIX and control any LED 3D matrix. We are not talking about bringing 3D movies to the world of LEDs. We are talking about real-time control of real 3D LED projects. "Our users said 120 Storage Places aren't enough." We have changed the maximum number of available storage bins to a whooping 256 Storage Places per Storage. And we have increased the number of Storages also to 256! That means, instead of 120 storage bins, 256 x 256 Storage Places are waiting to be filled with stunning effects! "Our users said they want more effects." MADRIX 3 will introduce new MADRIX Effects. On top, every effect you know has been improved drastically. You will be able to work in completely new ways and create new lighting visuals. "Our users said the Preview Windows need to have more options." We have equipped the new Preview Windows with a lot of new options. You will be able to rotate the Previews, zoom in and zoom out, and use many more features. On top, you can use the brand new 3D mode. MADRIX 3 will be updated regularly. And we think that more features will be added to MADRIX 3 in the future. Just have a look at the Release Notes of some of the MADRIX 2.X versions and you will see that our developers added many, many features to MADRIX over the years. We will continue to take your feedback seriously and try to improve the way how MADRIX works. Support for MADRIX 2.X will end one year after MADRIX 3.0 has been fully released. That means that we will not release any software updates for MADRIX 2.X after that date. During this one year, we will fix (critical) bugs and may improve some of the features with updates. But please do not expect any new features. Project support continues another 1 year after that. We think that MADRIX 2.X is still a great product with lots of useful features. If you decide against the next generation, we hope MADRIX 2.X will continue to be the product you want to work with. It is a product with years of development and will still be years ahead even if you do not choose to update. Thank you for your continued support! We think that MADRIX 3 will be valid for at least two years. We have currently no plans to release MADRIX 4 in 2013/2014 and to ask you to purchase a new product again in such a short time. If you wish to have a look of what to expect from 3D, please feel free to watch these custom-made shows with some very early effects of spring 2012. What will the price be for MADRIX 3? We won't change the price of our products for users that purchase a new product. Users who already use MADRIX are offered a price of 50% of their MADRIX 2.X product retail price. But not everyone will need to purchase the update. Please see the next question! I have just bought MADRIX recently before this announcement. Do I need to buy MADRIX again? Every user who purchased MADRIX on 21.03.2012 or any later date is entitled to receive the license update to MADRIX 3.X without any costs. Yes, MADRIX 3 will be free of charge for everyone having recently purchased a new product. In most cases, your MADRIX KEY will already be valid for MADRIX 3.X. What about MADRIX PLEXUS and MADRIX NEO? Every MADRIX PLEXUS user will also get the license update to MADRIX 3.X free of charge, no matter when the unit was bought. You will just need to update the firmware to the latest version. For MADRIX NEO users, there will be a possibility to purchase an update license for 50% of the retail price as well. Why do I have to pay for the update? I have already purchased MADRIX. There are many reasons you might consider updating to MADRIX 3. We hope that we have provided a lot of useful information on this website. We think MADRIX 3 will be a big step and a product that our users will look forward to use, just as they like using MADRIX now. We have worked very hard for this new version and we think the new MADRIX 3 product line will provide a lot of benefits to you! How does the update process look like? In most cases, the update can be done via e-mail. For more information, please contact your MADRIX reseller. How do I know if my MADRIX license is already valid for MADRIX 3.X? First, please connect your MADRIX KEY, MADRIX PLEXUS, or MADRIX NEO. In MADRIX, go to the menu Help > About... and a new window will open. Please check if you can see 3.X in the column MADRIX (instead of 2.X). If yes, your MADRIX license is already valid for MADRIX 3.X and you don't need to go through the update process. What about upgrades from MADRIX KEY 2.X to a higher MADRIX KEY license? Everyone purchasing a MADRIX KEY license upgrade (e.g., from MADRIX KEY basic to MADRIX KEY professional) will receive the MADRIX 3.X license update at no extra charge! The license update is included in the upgrade price. Can I test MADRIX 3 before I purchase an update? Does MADRIX 3 overwrite my current MADRIX installation? No. MADRIX 3 has its on installation path and will be installed separately. Can I use my old MADRIX 2 Setup Files? MADRIX 3 uses its own file types. MADRIX 2.14e (or higher) includes a special Export option to convert your file to a MADRIX 3 Setup File. What will happen to my MADRIX 2.X license when I update to a MADRIX 3.X license? The MADRIX 3.X license includes the MADRIX 2.X license. You can choose to use either MADRIX 2 or MADRIX 3. What will happen to MADRIX 2? As explained above, support will continue for MADRIX 2 for a limited time of 1 year once the new MADRIX 3.0 is released. Software updates will be released when necessary.